How to get Education Loan? Loan for college students/ education loan eligibility/ calculator: A major problem while college is paying the fee for college. Students usually take help of grants, scholarship and student loans to pay their fees. It is always advisable to take grants and scholarships as you will need to pay beck less. Pell Grant is very useful to students to pay for the college. This grant is available to all the students in the nation. It is a federal grant. The amount of the grant is decided on income requirements. You can get this grant till you successfully move towards getting a degree. Here we will discuss about Education loan eligibility. To avail a federal student loan or Pell grant you should fill FAFSA. You need not to borrow money but have to maintain eligibility. The first step is filling out Free Application for Federal Student Aid (FAFSA) so keep all the documents ready. You will need parent’s tax information, your tax information and savings accounts balances. You will need to inform about your parent’s income till you are twenty four years or you get married. Also confirm that school you are opting has qualified for Pell Grant. You can use school code to find this. Almost all technical and traditional schools are eligible. However if your school is not in the list you will not be eligible for grant. You have to apply for PIN that will work as your online signature. It usually takes three days for PIN to get verified by that time a temporary PIN is given to you, use it to complete the form. Online form is also available on FAFSA.ed.gov. You have an option of printing this form or you can also go to financial aid office if you need help to fill up the form. If you wish to get help soon fill the form correctly. After filling the form recheck the details you have given. You will be notified by financial aid office via your college and will let you know whether you qualify or not and if yes what amount has been sanctioned. It is not compulsion to accept the entire amount offered to you as loan you can accept what you need. Loan money will be sent to your college. College will deductthe tuition and fees and will hand over the left over amount to you. Pell Grant amount alone is not enough to pay your entire education expenses. Therefore you can choose a good student loan with the same form. Keep looking for other funds too. You can enquire about other scholarships and grants from related department of your college. Use online databases to find other options too. In every semester, try to apply for new grants and scholarships. If lucky enough, you may be chosen for tuition reimbursement program. Make habit of taking counseling in the beginning of every year. You should be aware of the amount you need to pay back in the end. To prevent yourself from debt, you may work or choose other school too. You will need Savings Account Information and Tax Returns for Self and Parents. 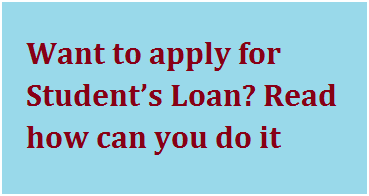 How to get loan for college students? Let’s get proper knowledge for personal loans for students with no income, how to get student loans from government, and eligibility for education loan from bank at one place. Previous Post:Which Foreign Language is in Demand and Best to Learn?